Shelley Abrams of Americans Against Horse Slaughter spent some time with Congressman John Conyers, the sponsor of HR 503 when he was in Philadelphia on Friday night. Congressman Conyers assured Shelley that, although there are many issues facing our country right now, he remains committed to passing this legislation and ending the slaughter of our horses. Conyers went on to say that while he can't accept any kind of animal cruelty, "horses are special" and they need our help. 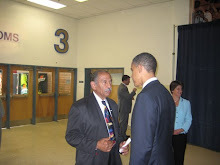 Congressman Conyers also said to convey his appreciation to members of AAHS and to all other groups and individuals who are working tirelessly to make this happen. Although getting HR503 is the end game, right now we have a time sensitive URGENT IL ALERT that demands a united effort. Please click on the following thread for details and once again, lend your voice to win this battle. URGENT IL ALERT! After you have called your own representative, please help us focus on the following list of those who cosponsored the bill last year. Please check back to this post daily. We will be removing names as they sign on to co-sponsor so this thread should be current every day. This list will be friends of the anti slaughter legislation so they should be the easiest to approach without going into a lot of detail. We will be editing this list daily as people sign on.....so please check this post each day. And we will start a new thread with current lists each week. Please Note: We have started a separate thread titled “State Action Needed”. Several States have introduced their own legislation to allow horse slaughter. These states need our help. to keep this from happening. Remember, WE ARE BARBARO’S VOICE.....Let it be heard.